Your body breaks down carbohydrates into their simplest sugar form for absorption. The glycemic index is a numerical ranking system that rates how quickly these sugars will raise your blood sugar. All carbohydrate-containing foods are compared to the simple sugar glucose, which is given a glycemic index of 100. Carbohydrates that break down quickly during digestion have a high glycemic index, while carbohydrates that break down slowly have a low glycemic index. 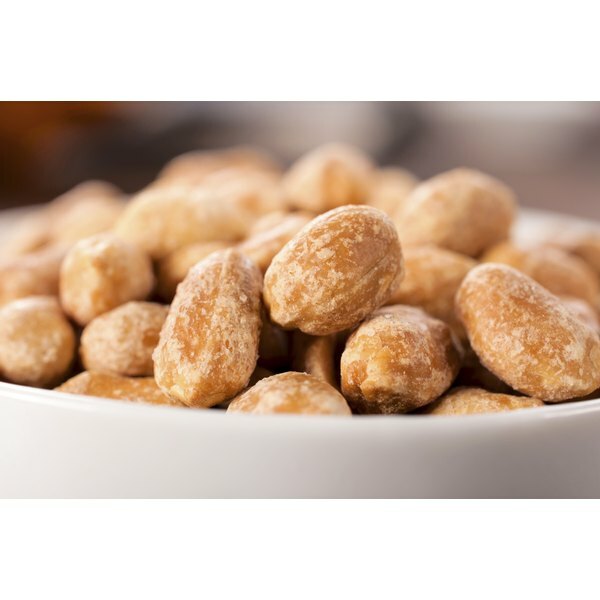 Peanuts are considered a "low" glycemic index food with a rating of 14 for a 2-ounce serving. Low glycemic index foods have a rating under 56. "Medium" glycemic index foods have a rating between 56 and 69, while "high" glycemic foods have a rating of 70 and over. Eating fewer high glycemic foods is best to help avoid conditions associated with poor blood sugar control such as diabetes and metabolic syndrome. Dr. Peter Nickless has been a chiropractor and Nutritional Counselor for 13 years specializing in sports nutrition and sport related injuries. He received a Doctor of Chiropractic degree, a Master's degree in human nutrition and has a Certified Nutrition Specialist CNS designation. In addition to clinical experience, Dr. Nickless has been an educator and administrator at the undergraduate and graduate levels for the past five years.